In software projects, it is most important to measure the quality, cost and effectiveness of the project and the processes. Without measuring these, a project can’t be completed successfully. In today’s article, we will learn with examples and graphs – Software test metrics and measurements and how to use these in software testing process. There is a famous statement: “We can’t control things which we can’t measure”. Here controlling the projects means, how a project manager/lead can identify the deviations from the test plan ASAP in order to react in the perfect time. Generation of test metrics based on the project needs is very much important to achieve the quality of the software being tested. What is Software Testing Metrics? What is Software Test Measurement? A Metric is a quantitative measure of the degree to which a system, system component, or process possesses a given attribute. Metrics can be defined as “STANDARDS OF MEASUREMENT”. Suppose, in general, “Kilogram” is a metric for measuring the attribute “Weight”. Similarly, in software, “How many issues are found in thousand lines of code?”, here No. of issues is one measurement & No. of lines of code is another measurement. Metric is defined from these two measurements. How many defects exist within the module? Measurement is the quantitative indication of extent, amount, dimension, capacity, or size of some attribute of a product or process. Test measurement example: Total number of defects. Please refer below diagram for a clear understanding of the difference between Measurement & Metrics. Take a decision on process or technology to be modified etc. As explained above, Test Metrics are the most important to measure the quality of the software. Now, how can we measure the quality of the software by using Metrics? Suppose, if a project does not have any metrics, then how the quality of the work done by a Test analyst will be measured? After the defect is resolved, need to re-test the defect & re-execute the corresponding failed test case. In above scenario, if metrics are not followed, then the work completed by the test analyst will be subjective i.e. the test report will not have the proper information to know the status of his work/project. If Metrics are involved in the project, then the exact status of his/her work with proper numbers/data can be published. 1. How many test cases have been designed per requirement? 2. How many test cases are yet to design? 3. 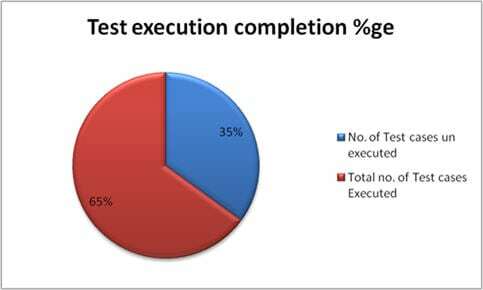 How many test cases are executed? 4. How many test cases are passed/failed/blocked? 5. How many test cases are not yet executed? 6. 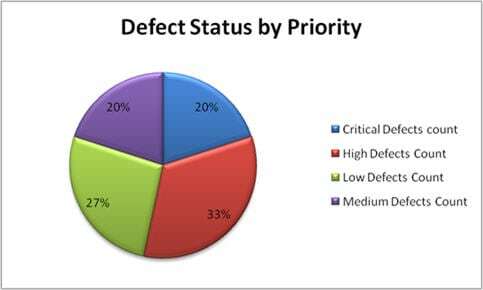 How many defects are identified & what is the severity of those defects? 7. How many test cases are failed due to one particular defect? etc. Based on the project needs we can have more metrics than an above mentioned list, to know the status of the project in detail. Based on the above metrics, test lead/manager will get the understanding of the below mentioned key points. d) Whether the project is going as per the schedule or lagging? etc. Based on the metrics, if the project is not going to complete as per the schedule, then the manager will raise the alarm to the client and other stakeholders by providing the reasons for lagging to avoid the last minute surprises. Testing Metrics are mainly divided into 2 categories. Base Metrics are the Metrics which are derived from the data gathered by the Test Analyst during the test case development and execution. This data will be tracked throughout the Test Lifecycle. I.e. collecting the data like Total no. of test cases developed for a project (or) no. of test cases need to be executed (or) no. of test cases passed/failed/blocked etc. Calculated Metrics are derived from the data gathered in Base Metrics. 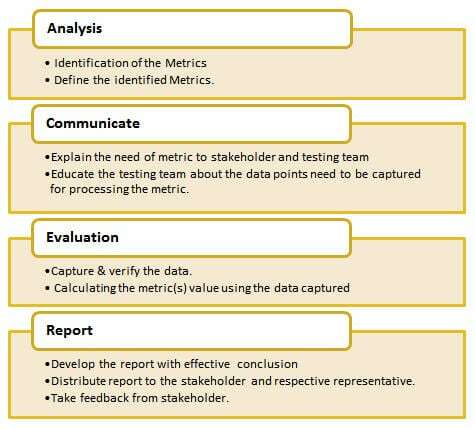 These Metrics are generally tracked by the test lead/manager for Test Reporting purpose. After the QA testing, during Alpha & Beta testing, end-user / client identified 40 defects, which could have been identified during QA testing phase. $8) Defect Leakage: Defect Leakage is the Metric which is used to identify the efficiency of the QA testing i.e., how many defects are missed/slipped during the QA testing. The metrics provided in this article are majorly used for generating the daily/weekly status report with accurate data during test case development/execution phase & this is also useful for tracking the project status & Quality of the software. About the author: This is a guest post by Anuradha K. She is having 7+ years of software testing experience and currently working as a consultant for an MNC. She is also having good knowledge of mobile automation testing. Which other test metrics do you use in your project? As usual, let us know your thoughts/queries in comments below. In my opinion, difference between metrics and measurements is described quite messy in the article. –Kilogram is rather measurement, than metric (which is also shown in Measurement & Metrics diagram, where Km and Hours are measurements). All 13 testing metrics in example table are rather measurements. Test metrics related to number of scripts automated, number of scripts passing/failing can be included. It’s something i really want to learn. But at present i am leading a project where test cases creation and execution were not used. So please suggest me how to create test metrics based on number issue found and number of issues closed/reopened. Just a simple question, is it true for DRE, the higher the better ? Just came across this post, pertaining to comments..
@rajeshri : i have been working for UHG in bangalore, Its a brilliant company to work(Fortune14). They provide you with plenty of WFH. I have been working as QA TL, I used to work from my home(Chennai) 2weeks everymonth. @Dipankar: It is obvious. DRE should be higher, it should be nearly 100%. If it is 100% then it represents testing is carried our perfectly hence there’s no UAT defects/Customer issues. What is the difference between test metric & traceability matrix? Great article! thanks for your help! This site is giving so much quality testing info for free….long live this site. For those who want to have an excel template of this presentation to be able just to apply your numbers and get the results you are welcome to send me an email asking for it. Would you please share the template you’re mentioning! Please share me excel, thank you! in my opinion; indians fit to do the back-house-keeping job, because any client is not a native, we all work for the testing part of it, and all these metrics or so what ever! is just to swipe out interview process, or to protect their seat!, further once working for a PMO client, one of the super manager asked why some one do these activities, when its already planned by the PMO; all job is to regress test or re-test or capture defect in the client specified tool or xls ; report the status of defects, well testing never evolves because actual QA lies in the core industries and s/w is just naive or nothing! The difference between metrics and measurement is simply. Metrics are mathematical (quantifiable), and can have a number applied to them. Measurement is the larger body, that contains metrics among other things. Measurement, therefore is both qualitative and quantitative. Metrics resides within measurement, but measurement also includes the qualifiable (tall, red, married, etc.) – values that do not have an associative number value, like metrics do. 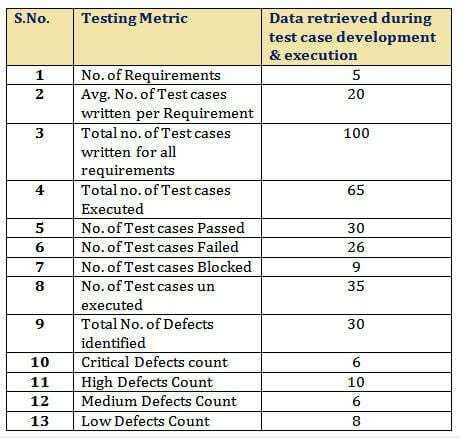 How the estimates can be prepared before test execution starts. What are the points to be covered in estimation except the resource,environment. Nice explanation on types of metrics. One can refer puretestingbits.blogspot.com or testingpanda.com for more testing metrics such as load factor, size variance, Quality of fixes, % Risk mitigation efficiency, Review Effficiency etc. Can you help me? How can we map the software test metrics to software quality? Based on ISO 9126, the good characteristics of software product are functionality, usability, efficiency, reliability, maintainability and portability. Which software product quality characteristic that software test metrics measure? Metrics is some thing you derive from Measurement. It is like you measure for a period of time or multiple items and from the number you have collected you derive Metrics. this is measurement, when you take an average of Age which will be 25 yrs(I.e (15+20+25+30+35)/5 =25), this 25 is Metrics. Hi Jordan could you pleae send me the excel template of this presentation to be able just to apply my numbers and get the results. Good one on types of metrics with examples. Defect leakage should be number of defects found in UAT/total number of defects(UAT+QA testing)*100..
Denominator should be Total no. of Test cases written or in scope. Pass and Fail only will account for Executed. If the test case is blocked, obviously, it cannot be executed. Hence, it has to be part of un-executed. 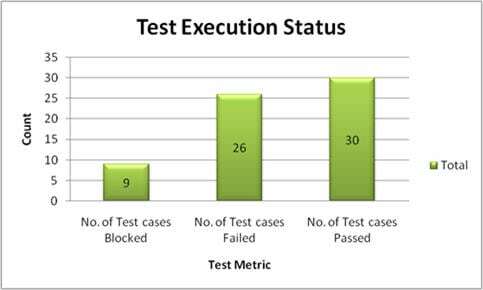 %ge Test cases Blocked: This metric is used to obtain the blocked %ge of the executed test cases. A detailed report can be submitted by specifying the actual reason of blocking the test cases. %ge Test cases Blocked = (No. of Test cases Blocked / Total no. of Test cases written) * 100.